Recently I have come to cherish my little office space in our house. It is my space to go and work or write in peace, hopefully. Sometimes I have a helper or two visit me. My office wasn’t always set up in a way to make it useful for me. It was the catch-all for furniture and items we didn’t want to get rid of but didn’t know what to do with. About a year ago, Jim and I decided to really redo my office to make it work for me. Now I have a big desk/work space, plenty of shelf space for books and files for papers and a little TV to keep me company (I like to work with the TV on; I like the background noise). That is not to say that everything has its place. After working on the kitchen table or couch for at least a year and then having my own space for a year, I realize how important it is for people who work from home to have a space of their own. 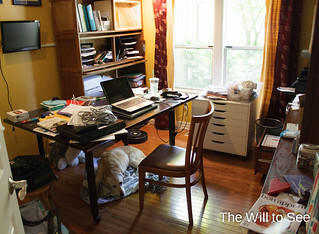 It doesn’t have to be a big elaborate office — a simple desk can work too. But it just should be a space that is all yours. That way you don’t spend half your work time setting up your space or cleaning it up to feed your family. In your space should be things that help you work, like note pads, office supplies, storage for reference materials and a comfortable spot for your computer. If you like background noise, having a TV or radio in your space is good too. The most important thing is to make it your own. I love my little space that looks out onto the front yard and my hydrangeas. Jim has built me two great storage boxes for my papers, since I tend to pile papers. What is your workspace like? Do you have a great view? What one special thing is in the space that makes it yours? Love your post! My space has a window that looks out into the woods and onto the driveway. I love it and it works for me. All my little bins and boxes for storage are close by, but I like to keep my desk clutter free. It helps me think better. We do not have a den so my office is the 4th bedroom which was my daughter’s when she was little. (She is 30 & long ago flew the coup!) I just had the “little girl’s border” taken down and painted a color I love. I’m gathering & enlarging photos I have taken during our travels over the past 32 years. We have been very fortunate to have traveled all over the world and the photos bring back such great memories. For me the room will be an escape from everyday life and I’m looking forward to everything being done so I can enjoy MY new room.